Led by member and IU curator Sherry Rouse, BPC members toured the Wells House in July. Nearly two dozen BPC members absorbed Indiana University history on a July 26 field trip to the Herman B Wells House. Wells was IU president from 1937 to 1962, and he continued as chancellor until his death in 2000. He remains a university icon. The university grew exponentially during Wells’ presidency, and his imprints on the university were numerous and long lasting. He recruited nationally-renowned faculty, supervised planning and construction, developed and preserved green space, and led desegregation on campus. Starting in 1961, the federal-style house on 10th Street, across from IU’s Wells Library, was his home. Leading the tour was BPC treasurer Sherry Rouse, the curator of campus art for the IU Office of Risk Management. 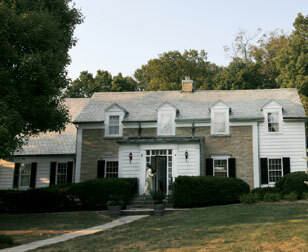 The two-bedroom house had been built in 1939 by Lloyd and Lillian (Riley) Setser. Lloyd was IU’s first full-time real-estate manager, and Lillian was an antique dealer and former schoolteacher. The scalloped wood trim, French doors and secluded back yard reflected Wells, Rouse said. So did the art and antique furniture and glassware he acquired from near and far, not just for his house, but for other campus buildings. After Wells’ death, furnishings were eventually dispersed and/or sold. Among Rouse’s duties, she said, was the long-term challenge to refurbish the house with period pieces, including some of Wells’ own furniture, art and glassware. BPC members ate lunch above what was once Wells’ swimming pool, now a small banquet room at the rear of the house. Rouse then led members through the first-floor breakfast room, dining room, living room and study, before moving to the second-floor master bedroom, guest room and study. This entry was posted on Monday, August 16th, 2010 at 9:05 pm and is filed under Guest speakers. You can follow any responses to this entry through the RSS 2.0 feed. Both comments and pings are currently closed.